Life is short and shorter for smokers. Just legalise vaping. Though short, it is basically right and sufficient: no-one is trying to live forever; everyone is trying to enjoy the life they have; some people like the drug nicotine or don’t want to quit enough to stop using it; smokers die earlier because of smoke; vaping avoids the smoke problem and does not appear to create new material problems; so it follows that vaping should not be illegal. In fact, it should be encouraged. It really is that simple. The dissenting reports prompt me to raise the issue of simplicity versus sophistry in the debate over tobacco harm reduction. This has bugged me for years. Vaping and tobacco harm reduction is basically simple. The arguments raised against it by anti-vaping opponents are laden with sophistry. This blog looks at ten forms of sophistry used by anti-vaping activists to fabricate and fuel faux controversy. It is longer than I would like, but the subject is far from exhausted. Please dip in. One of the reasons I resent spending any time on vaping and tobacco harm reduction is that it is a really simple issue and should all be settled by now. There are many complex problems like worklessness in de-industrialised communities, mental health, identity politics, fundamentalism in all its forms, poverty and governance in developing countries, climate change, water stress, criminal and terrorist networks, privacy versus security, globalisation and its effects, causes and remedies of financial crises, health and social care reform with aging populations – I could go on. The list of terrifyingly complex problems is endless and all deserve sustained attention and debate. But vaping and tobacco harm reduction are not among them – the issue is controversial because of cynical application of sophistry, not because of inherent complexity. The health problem is smoke. There is major public health problem caused by smoking tobacco as a means of taking the mildly psychoactive drug nicotine. The problem is overwhelmingly caused by smoke. The harmful agents among the thousands of products of combustion of dried and cured tobacco leaves lead to excess cancer, cardiovascular disease and respiratory illness, and much else. Nicotine is a relatively benign drug. The popular drug nicotine is relatively benign. When administered without smoke does not cause material harms to health. Nor does it have drug-related harms such as overdose, intoxication, loss of control and vulnerability, violence or accidents – and it may have some benefits. Inhaling tobacco smoke is the dominant delivery system for nicotine, but it need not be that way. We are more concerned about the drug nicotine than, say, the drug caffeine mainly because the former is associated with delivery through smoking and all the disease that causes, and the latter delivered through drinking tea and coffee which do not cause notable health problems. Anti-smoking policies cause harms. The policy measures to reduce smoking also cause harms and limit their acceptability. These include regressive taxation, stigma and harassment, deceit and state-imposed infringement of various freedoms. These harms place political and ethical limits on anti-smoking policies. Energy technology provided a breakthrough. New ways of taking nicotine have emerged that don’t involve creating smoke and eliminate almost all of the risk associated with exposure to products of combustion. This has emerged because of progress in energy technology (compact batteries) which can provide a source of energy to create an inhalable liquid aerosol in sufficient volume and sufficiently quickly in a compact form suitable for use in modern consumer products. Snus provides a proof of concept. We already know that this can work to reduce smoking and smoking-related disease through the experience of snus – smokeless tobacco – in Scandinavian and Nordic countries – but we expect vapour based products will be more broadly applicable because of the similarity to smoking – e.g. through inhalation delivery, sensory experience and behavioural ritual. Willing consumers are acting in their own interests. Consumers have responded by adopting these products, not as “smoking cessation” products, but as consumer alternatives to cigarettes retaining many of the things they like but without the disease, death and stigma. The experience of family, friends and colleagues backed by an elaborate ecosystem of support through vape stores, social media, reviewers and vape meets have emerged up to support consumers making this switch and allowed them, to some extent, to resist anti-vaping propaganda. To the extent they are used by adolescents, it appears they contribute to lowering teenage smoking rates and provide a public health benefit. Innovative producers are changing the marketplace. Producers have responded and there has been a remarkable pace of innovation since 2010, in which better and better products and improved understanding of needs has steadily widened the range of smokers who will willingly adopt these products. This process of innovation could continue to revolutionise the consumer nicotine market over the next 15 years and create products that will appeal to almost all smokers. Quitting by switching is easier than abstinence. Because switching between nicotine products involves giving up less than achieving nicotine abstinence but almost the same health results, it may be possible to get much faster and larger health benefits. We have recently seen remarkably rapid changes in the mix of nicotine products used in Japan as consumers have opted to switch to heated tobacco products and cigarette consumption has fallen sharply. Light regulation has facilitated competition – so far. Until recently, light consumer regulation and limited taxation have allowed vaping products to compete against the entrenched incumbent cigarette industry while moving fast to innovate and gain market share. Regulators are now intervening to increase burdens and restrictions, and even prohibitions, on this new technology and, in doing so, are protecting the cigarette trade, inducing fear and confusion in users, and throttling development and diffusion of radically health-improving technology. This is creative destruction… and it is good. What is going on is the normal process of technological advance (previously very slow in the tobacco market) in which innovation provides a new feature (flavours) or solves a problem (avoiding the use of toxic smoke to deliver a drug) to the benefit of consumers. This creates a new ‘value proposition’ that steadily improves until it rivals and eventually overcomes the established value proposition provided by cigarette smoking. It happens gradually at first and not universally, but it may reach a ‘tipping point’ and precipitate rapid global change – in this case, that would be with vast public health and welfare benefit. I think most people will recognise this as a normal and beneficial process of technology development – I certainly find this when I explain it to friends. and remember (or discover) your responsibility to tell the truth through communications and neutral research, not to try to rig science and media coverage to manipulate opinion and behaviour. But mostly, stay out of the way. Do nothing. Don’t interfere. You are sure to make it worse and do harm. But if ‘stay out of the way’ is what they should do, what do they actually do? What has been the reaction to an obvious and very substantial technological improvement in the way that people can consume nicotine? The reaction has been extraordinarily negative and harmful, involving disgraceful levels of sophistry to try to turn highly beneficial technologies from an amazing opportunity (see 1-10 above) to a dread threat to be fought to a standstill. Some of the techniques employed by tobacco control activists have been outrageous. And by activists, I include many academics, employees of health and medical organisations, philanthropists and their well-funded proxy armies of grantees, and almost everyone involved in tobacco at WHO. Desperate enterprise and malign creativity have gone into implying that vaping products are far more harmful than they are or could conceivably be, even though the fundamental cause of harm (smoke) is absent. There are hundreds of examples, see this example and this), and especially bogus formaldehyde measurements and grossly exaggerated claims about diacetyl that contaminate the discussion of risk with outrageously misleading falsehoods (even in the New York Times: The Formaldehyde in Your E-Cigs, 4 April 2018) right to the present day. Let’s be clear here – even the Public Health England and Royal College of Physicians estimates that vaping is at least 95% less risky than smoking are cautious statements from conservative organisations. There is no sign of any material risk at present – and if one emerged, then it would likely be relatively easy to fix. So a range of deceptive practices has been deployed to create fear and confusion about risk: operate the equipment in unrealistic (e.g. ‘dry-puff’) extreme conditions for human users; focus on the presence of chemicals that may be harmful if there is enough exposure, but without showing there is enough exposure; abuse the most basic concepts of toxicology – the dose makes the poison; ignore or avoid comparisons with cigarettes; avoid reference to benchmarks of ‘materiality’ like occupational exposure limits; report changes in the body (e.g. the response to a stimulant) as if it demonstrates a risk, even though epidemiology shows no risk; use cell and animal studies, often with excessive exposures, and then misinterpret the results… the list is too long and depressing to continue, but I have written more on this in The critic’s guide to bad vaping science. One of the worst sins of dirty scientific play is the use of false analogies. Take this one, often used as if it contains a clarifying insight… in fact, it contains a deadly deception. Back to reality… the chance of death in a jump from both 10th and 20th floor is approximately equal and approximately 100%. How is that an adequate and candid characterisation of the risk of using snus compared to cigarette smoking? Snus carries 1% or less of the risk of smoking (here, here). If you insist on using a rapid death analogy like this (and you really shouldn’t), then cigarette smoking would be closer to jumping from a fourth floor, and snus use about as dangerous as walking down the stairs. To complete the picture, there is also no evidence that snus creates a gateway or that modern snus products carry material cancer risks. So no, let’s not call it science. 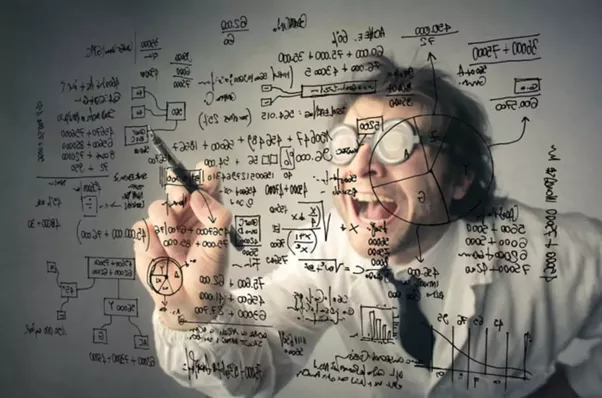 It is a ‘science-like’ activity – a kind of social marketing dressed up with grants, experiments, papers, journals, press releases and science journalists to look like science. All the adornments of real science but not actually science, in the sense the word is meant: an open-minded inquiry into the workings of physical, behavioural, social and economic systems. This is science with a predetermined objective, primarily to justify coercive and punitive policies. You only need to look at the completely unjustified (without exception) policy recommendations made at the end of many narrowly-focused data papers to see the underlying policy biases revealed. Even if it is reluctantly conceded that these products are less harmful to the user, in the bizarre activist worldview, smokers somehow use these much safer vaping products to increase their overall risk by smoking more. Surely the starting point should be the basic idea that people will use safer products to reduce their risks, rather than to increase them? Isn’t that rather obvious? That is at least the testimony of thousands of vapers and the repeatedly-stated reason for vaping. So you would need strong evidence to support the extraordinary and counter-intuitive claim that smokers use safer products in a way that puts themselves at greater risk. 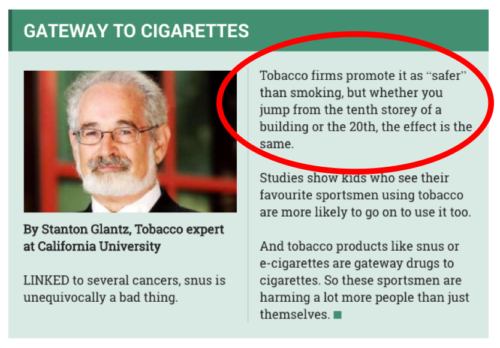 So, facing this uphill struggle against common sense and what people actually say, every statistical sleight of hand and every form of error of reasoning has been deployed to imply that vaping is causing more smoking (see example). Never mind that adult smoking is falling rapidly in the UK and US. Never mind that the studies are riddled with selection bias, implausible counterfactuals, ridiculous measures of exposure like ‘ever use’, near-religious belief in the accuracy of highly unreliable measures of susceptibility or propensity to smoke or vape, constant confusion of association with causation, and a child-like faith in regressions to eliminate ‘confounding’ as if confounding is a bit of statistical grime that needs to be polished off otherwise perfectly explanatory data (it isn’t: see Carl V. Phillips on confounding and the gateway effect). Confirmation bias is everywhere and undeclared biases and priors are pervasive. Harm is the essential currency of tobacco control campaigning. For these activists, cancer and other harms have acquired valuable utility: it is the ‘killer’ arguments to justify the forceful action of the state. If there is no cancer or other harms, they have lost an argument to support the real goal. Hence we see desperate, often risible, efforts to turn nugatory risks into full-blown moral panics. If concerned about health, why do they never talk about how e-cigarette vapour has few of the harmful agents present in cigarette smoke and those that are present at far lower concentrations? Because disease risk creates the currency of fear and righteous indignation, and fear and indignation is the gateway to regulation. This is why you can see some activists jump for joy at every report of an exploding e-cigarette or newly discovered harmful agent causing exotic diseases like ‘popcorn lung’ (even if these are obvious falsehoods given a minute of scrutiny). The glee is almost irrepressible, but the appropriate emotional response to the discovery of harms in products that are used by millions should be concern and dismay, not excitement. But harm is everything: what if vaping products are basically harmless? That would be a huge win. But not for the anti-vaping activists. Anti-vaping activists exhibit revealing behaviour with some of these claims. So for example, they raise concerns about a flavouring agent, diacetyl, causing ‘popcorn lung’ (a baseless claim). If they were really concerned, they could call for diacetyl to be prohibited. But no, it is more useful to their cause out there as an unmanaged risk. In fact, they back systems of regulation (e.g. FDA and European Union) that will prolong the presence of these substances in e-liquids. The substantial increase in e-cigarette use among US adult smokers was associated with a statistically significant increase in the smoking cessation rate at the population level. user behaviour may evolve over a longer time frame than a typical trial, for example going from occasional use, to dual use, to occasional smoking, to exclusive vaping. Throughout this period there would be learning and upgrading to better, more personalised products. RCTs don’t adequately capture the processes of evolving behaviour and ‘diffusion of innovation’. There is little apparent interest in discussing how the impact of this technology should be evaluated, just a tactical emphasis on types of evidence that are inadequate but, most importantly, weak or inconclusive. A recent RCT (Hajek et al, NEJM, 2019) did, in fact, show significantly greater efficacy for e-cigs compared to NRT in a randomised controlled trial. Does the argument I made above mean this RCT is irrelevant? No. It means that when as much as possible is done to control for everything other than the technology in a group of volunteer quitters, then vaping is superior – and that adds important new evidence, but it is not definitive. It is exactly what you would expect because vaping replicates several aspects of smoking (throat sensation, taste, behavioural ritual as well as nicotine) that NRT does not. It is also important politically because many actors regard RCTs as a gold standard (even if this is not universally the case), either because they see the issue in medical intervention terms or because they just use any negative argument to hand – and not with great attention to consistency. Anyway, leaving motivated sophistry and internet trolls aside, we have to be clear what RCTs do and do not do. They definitely provide valuable information, as discussed above. But this RCT doesn’t tell you how vaping works in the real world outside a clinical setting, or ‘in the wild’ with people who may not be trying to quit, may learn or evolve the technology they are using or may undergo a transition from smoking to dual use to vaping over several years. It would not surprise me if the efficacy of vaping increases over time due to learning and technology evolution, whereas NRT efficacy is more likely to decline through relapse. That’s the difference between substitution and abstinence. The former proposition can improve over time – the latter is always the same. Anti-vaping anecdotes (e.g. battery fires, any claimed side-effect, kiddie flavours, Juul craze etc.) – vital evidence, an important early-warning and sound basis for decisive regulatory intervention. Pro-vaping anecdotes (e.g. thousands of people saying vaping has helped them to quit smoking when nothing else worked and they feel much better for it) – unreliable testimony from pro-vaping shills not supported by scientific evidence. The case of snus in Sweden, where smoking rates are anomalously low and disease rates are also much lower than the norm is a big win and strong proof of concept for tobacco harm reduction. But many prominent figures in tobacco control refuse to acknowledge this proof of concept because it would rock their prohibitionist abstinence-only stance and require them to admit that a tobacco product made by a tobacco company has decisively lowered smoking prevalence, and related diseases, to levels not achieved by conventional tobacco control methods. There is a mountain of evidence supporting the case that snus is a very low-risk product and beneficial at the population level. It is obvious that something exceptional is happening in Sweden and no other credible explanation is available – see here for a recent overview. But one lawyer for the European Council, defending the indefensible EU ban on snus, claimed that the low level of smoking in Sweden was due to Sweden’s generous system of paternity leave, others have attributed it to Sweden’s low level of smoking at the end of World War II. I would like to say ‘you couldn’t make it up’, but they clearly can. Can demonstrations of extreme sophistry help to expose underlying motives? I think so. My view is that anyone pronouncing on these issues should declare their views on snus in Sweden. If they don’t accept the public health benefit, then it indicates that their views on all related issues should be disregarded – it’s a matter of testing for credibility and sincerity. If they are in denial about this, then they have a purpose that is nothing to do with health, well-being or welfare. It’s a good question to ask anyone in ‘tobacco control’ – how do you explain the very low smoking rates in Sweden? If they come up with another explanation than snus, the conversation should end there. If they don’t know, they are either lying or professionally negligent – if you are in that business surely you should know about the world’s greatest ‘tobacco control’ achievement? “Protect the kids”… sounds like a valid rallying cry, but it has become a basis for seeding moral panics (see the wretched New York Times again). But the children and the panics are a means to an end. Kids have been weaponised in an activist battle to bend the adult world out of shape where it serves an abstinence-only agenda: control of adult behaviours is the primary goal of activism to protect youth. In this world of panics, consumers (adolescents or adults) have little or no agency and make no decisions for themselves, all companies are predatory capitalists determined to hook kids on nicotine, marketing and “kiddie-flavours” are the evil means by which it is done. There is very little reality in this ‘corporate predator’ model of teenage risk behaviours. How would marijuana have become so popular? Yet there are many things that are dangerous to kids that we do not stop adults doing to protect the children – alcohol use being the most obvious of many. There is a legitimate debate to be had about the appropriate extent of protection of children from risks deemed acceptable in adult society, including whether such protection might compromise growth into fully functioning adults or prompt rebellious counter-measures on the part of the young. My view is that there are a lot more troubling teenage risk behaviours than vaping. However, even these arguments are too sophisticated for our purposes and, in any case, they are never discussed thoughtfully among tobacco control activists. 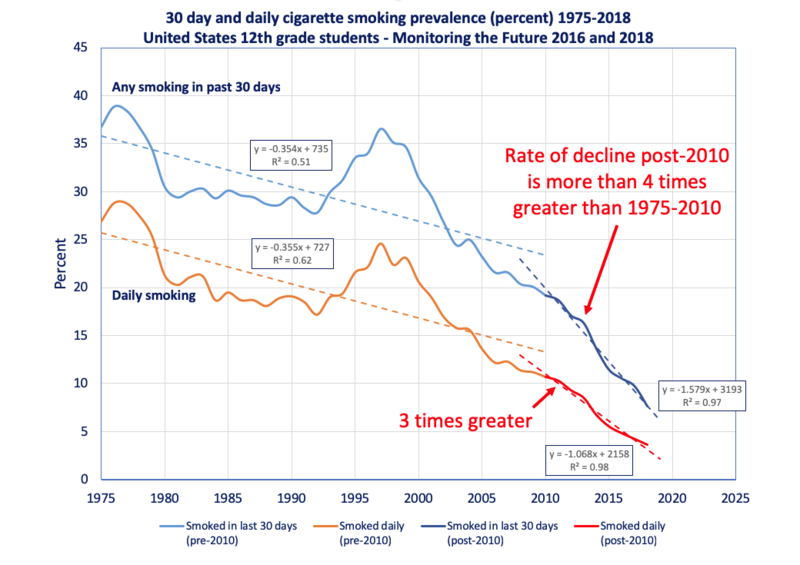 The anti-vaping activists are struggling with the simple reality that while vaping has risen, smoking has been falling unusually rapidly among adolescents, and much of the adolescent use is occasional and without nicotine (e.g. see US data here and chart below). Further, if you care about kids, how about listening to them? Young people give ‘harm reduction’ justifications as the most common reasons for vaping when asked (here), and regular vaping – an alternative to smoking – is highly concentrated among young smokers or would-be smokers (here and here). 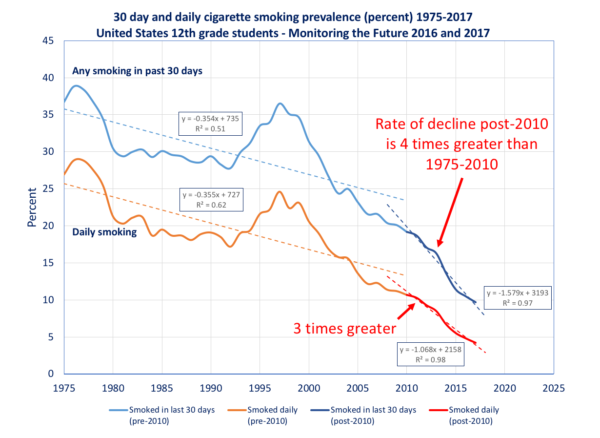 We see a rapid decline in smoking among adults, at least in part attributable to vaping (here), but by what mechanism would this effect start abruptly at 18, and not also contribute to the rapid decline in teen smoking? We also have the economic studies of vaping interactions with smoking when restrictive regulation is applied (here and here ). So despite the ‘children card’ being played relentlessly, it is more likely than not that e-cigarettes function to protect adolescents against smoking and hence are beneficial to teens. Moral panic case study: “Juuling”. The New York Times ‘I can’t stop’: schools struggling with vaping explosion, and CNN, Vaping now an epidemic among US high-schoolers and dozens of other American news outlets have been feeding a moral panic about Juul e-cigarettes. This effort is obviously prompted by the Campaign for Tobacco-Free Kids, which has its fingerprints all over it (e.g. here, here, here, here, here, here, here) as part of its campaign to wipe out the vaping industry by forcing FDA to bring forward extremely burdensome and restrictive regulation that will leave only a few products from tobacco companies on the market, if that.Rapid rises in ‘Juuling’ (the use of Juul e-cigarettes) are being cultivated into a full-scale moral panic, as far as I can see based only on anecdote and the outstanding success of Juul as a product. But let’s suppose there has been a rapid rise in Juuling in American schools – it really is a teenage craze. But how can anti-vaping activists be sure it isn’t a reason for celebration rather than panic? No-one currently pimping up the moral panic can be sure the rise of Juul is not simply the best news in years. For all these anti-Juul activists know (which is almost nothing), the Juul craze (to the extent it is real) may be driving out smoking from schools, finally breaking the myth that smoking is cool, diverting kids from other risk behaviours like illicit drugs, and giving adults an easily accessible simple alternative to cigarettes that they can buy easily and learn to use without needing an engineering degree. That would be great news! The more popular, the better – smokers may be finally overcoming the barrage of deceitful nonsense from ‘tobacco control’ and getting on with the business of quitting smoking. So, before anti-vaping activists blunder around in the dark making policy demands or clumsy interventions, just remember that it was only a few months ago that the activists’ primary explanation for adolescent vaping was ‘kiddie-appealing’ flavours with demands that most or even all flavours should be banned. But there is nothing kiddie-like about the Juul flavours. They should admit this: they just don’t know what they are doing. Or rather they do know what they are doing, but it just isn’t what it appears. For the activists, young people function as a means to stimulate moral panic, a human shield against criticism, and a mighty sword with which to smite adult freedoms, choices and autonomy. Groups like the inappropriately named Campaign For Tobacco-Free Kids and Truth Initiative have a fabricated an entirely bogus model of the youth at risk – usually depicted as an angelic 12-year-old in soft focus – images designed to raise terror in comfortably middle-class parents. They show no sign of understanding or caring about the real world of adolescent risk behaviours or insight into the lives of the young adolescents at risk. They will never admit that a young person who vapes instead of smoking is a success, or that vaping offers the option of a later route out of smoking for committed young smokers, that marketing vaping and attractive flavours may be pulling kids away from smoking. They are not even curious about whether that might be the case. The activists claiming to act in the interest of kids do not have the backs of the kids really at risk and know little about the kids in question. Here’s a typical statement… in this case from the American Cancer Society’s recently improved statement on e-cigarettes, but there are many examples. Based on currently available evidence, using current generation e-cigarettes is less harmful than smoking cigarettes, but the health effects of long-term use are not known. But what is that really saying…? To me that says very little, other than inducing fear and confusion. First of all, ‘less harmful’ could mean anything from 10% less harmful to 99.9% less harmful. If the reader perceives, incorrectly, that the difference in harm between smoking and vaping is small they will be more concerned that other risks may reverse this verdict in the future. Such risks might include using other than the current generation of e-cigarettes or health effects that emerge over the long term. But that is very far from a realistic, candid and actionable communication of what is known and likely to become known about risks. Of course, there are no 50-year cohort studies in which we can study people who smoke, never smoke and only ever vaped. There is unlikely to be one for many decades if ever – not least because most current vapers will have been smokers at some point – and it will be impossible to isolate e-cigarette effects from prior smoking, which will dominate health impacts. In long-term studies, e-cigarette use will look mostly like smoking cessation. The demand for long-term data is, in reality, tactical – the raising of an impossible evidential hurdle that could not be surmounted however amazingly successful the vaping products are. The simple reason for this is that we have not mastered time travel, and cannot send a grad student forward in time to look back at what happened over the coming 50 years of use. But ‘no long-term data’ does not mean ‘no data’ or that we know nothing – in fact, there is a great deal of data on the toxicology of vapour and the exposures experienced by vapers. It all points in one direction: massively lower exposure to hazardous agents, and hence much lower risks – the legitimate dispute is whether the risks are 90% or 99.9% lower. So yes, there are uncertainties but that they are much less risky than cigarettes is beyond any reasonable doubt. We know much more today about toxicology, physiology, pathways and mechanisms than when cigarettes emerged. We have huge insights from occupational and environmental health exposures. The range of analytical techniques and equipment is far superior to that available in the past. Finally, the vapour is much less complex chemically than cigarette smoke – and problems that do emerge could be tackled as they become understood. This is far more difficult with cigarettes: combustion creates thousands of new agents in a largely uncontrolled process, whereas the vapour aerosol comprises mainly of the ingredients and contaminants in the e-liquids. There are so-called experts who claim that identifying much lower exposures doesn’t prove lower risk. But like the rest of the sophistry coming from tobacco control, that implies they have a bizarre and implausible theory of the human body that they would be unable to explain if asked. Imagine if cigarettes were invented today – we would know immediately that they would be dangerous sources of cancer. Imagine too that there was a political interest group claiming that we should wait 30 years for the cancers to emerge or we can’t be certain of the risk. We would be rightly dismissive. But there would be a logical and ethical symmetry with the way calls for long-term data and uncertainty are deployed for tactical ends – and likely with the same effect: more smoking. This is why I see parallels between the sophistry of the tobacco companies of the 1970-80s and the anti-vaping public health activists of today. “We just don’t know the long-term effects” is a truism about everything new, but a frequent refrain among anti-vaping activists. But you rarely hear the version of future uncertainty that goes: “we just don’t know whether vaping will make smoking obsolete and save several hundred million lives, and nor do we know whether our prohibitionist regulatory ideas will stifle the displacement of smoking by vaping and so cause millions more to smoke and die“. In other words, they always take an asymmetric, responsibility-ducking approach to the future and uncertainty. Which brings us to the precautionary principle. Lung Foundation Australia has welcomed the precautionary approach outlined by a parliamentary committee’s recommendations for electronic cigarettes, following an inquiry into their use and marketing in Australia. E-cigarettes are relatively new and the long-term health impact remains largely unknown. With what we know about the impacts of cigarette smoking today that we wish we had known years ago, taking this precautionary approach until we gain a deeper understanding of the long term health impacts is critical. how uncertain is the science of vaping, and where are these uncertainties? where is the risk assessment of ‘inaction’ – i.e. not having a prohibition, and how risky is it, especially given experience in Europe and the United States? which precautionary measures short of Australia’s de facto prohibition have been considered? why are you an ‘interested party’ and why do your views carry weight compared to those actually at risk from smoking? how have you incorporated the views and experience of vapers and smokers into your assessment? how can a ban on vaping be ‘proportionate’ when there is at present no sign of any material risk and many smokers report using vaping to reduce or eliminate a higher risk – that of smoking? how is it non-discriminatory if at the same time the dominant incumbent rival products – cigarettes – are permitted and widely available, yet the cigarettes have far higher risks? where is the assessment of the costs and risks of a de facto nicotine vaping prohibition? There are very obvious risks associated with denying users an alternative way to quit smoking that is proving effective elsewhere: how do you know that what you describe soothingly as ‘precautionary’ is not in fact ‘reckless’, ‘harmful’ and negligent’? how have you weighed the costs and benefits of action and inaction? when did you last revisit your position based on science, or are you captured by group-think? if you are wrong (which by the way is a near certainty) how will you be held accountable for misusing the precautionary principle in a way that harms people? Will you resign, fold your organisation, pay damages, face litigation? have you approached your scientific, ethical and legal responsibilities as a professional or as if you are a gang member? Aside: in my view, the precautionary principle is best reserved for particular types of risks such as those that are: novel systemic risks to complex dynamic systems; may be irreversible or accumulative; may be susceptible to tipping points or other instabilities; and/or have dread consequences (think 28 Days Later!). For example, releasing a mutating biological agent or a predator/parasite into an ecosystem, geoengineering, cloud seeding, aspects of artificial intelligence or algorithmic decision making, the release of bio-accumulative substances or gases that increase radiative forcing, huge but incomprehensible derivatives instruments and Brexit. Vaping is a personal behaviour that can be stopped by any individual and regulators can control risks if and when they emerge through product standards. This argument is obvious nonsense. Vaping and other non-combustibles provide new routes out of smoking, lower the personal cost of quitting smoking. This is because they require the user to give up less because they can continue using nicotine, replicate behavioural and sensory aspects of smoking and adopt it as a pleasurable lifestyle choice. It is a very different approach to smoking cessation compared to the illness – treatment – cure model. The availability of alternatives is integral to any behaviour change strategy, which relies on people having options they can choose in response to incentives and encouragement. So a tax increase on cigarettes can have a more beneficial public health effect if there are more, better and easier options to respond to the price signal. If you are going to raise regressive taxes that will hit the poor and other disadvantaged groups very hard, then there is, as a minimum, an ethical obligation to mitigate the welfare loss by improving the options to avoid the tax by switching or quitting. Increases in tobacco taxes are sometimes described as being ‘regressive’, in that poorer groups in the community are likely to pay a greater percentage of their income on tobacco taxes compared with more affluent groups. Since it is precisely the poorer, less educated and younger population sub-groups that provide a large proportion of the tobacco industry’s customers, it could equally be argued that the tobacco market itself is regressive. There then follows a lengthy justification for punishing the poor. The consequential harms of conventional tobacco control measures (i.e. harms caused by the policy, not the product) include economic pain, time loss, stigma and shame, inconvenience and lost time, isolation, and denial of various freedoms. These are rarely discussed in tobacco control literature other than to dismiss them or consign harms to smokers as inevitable collateral damage or even regard them as benefits – ‘incentives to quit’. But these policy-induced harms place a political and ethical limit on how far these measures can be taken. Once that threshold is reached, then a public health policy has to rely on encouragement and options. Many would say, “all of the above”. But this is inadequate and lazy: it is important to pick a primary goal because policies involve trade-offs. For example, it might be possible to prevent more initiation of vaping by adolescents but at the price of more disease and lower welfare. So would you make a choice that prevents or reduces youth initiation (almost impossible, by the way) but means a few thousand additional people die prematurely? The flaccid thinking behind most tobacco control activism muddles these objectives and moves between them, often deploying “what-about-ism”: what about smokeless tobacco? what about nicotine addiction? what about the children…? In the end, the refusal to face real life trade-offs leads to impractical or counterproductive absolutist, abstinence-only prohibitionist positions. The only way you can resolve all the competing objectives simultaneously is to wish all forms of tobacco and nicotine gone instantly and simultaneously. These authoritarian fantasies are unconnected to reality or any practical effort to reduce harm or improve welfare and will achieve nothing at all. But I guess they sound impressive within activist echo-chambers and are surprisingly common. Perhaps the most feeble, though probably the most common argument is the a priori assertion that if the tobacco industry is involved, whatever it is must be bad. Any activist in any sector benefits from having an enemy that can be acclaimed as evil – see oil, nuclear, genetic engineering, baby formula, timber, mining – all the best campaigns demand enemies. The tobacco industry is the perfect enemy, or rather the tobacco industry ossified in into its 1980s form is the perfect enemy. So, why can’t tobacco companies do as asked? To call for an immediate end to production and marketing is either a wholly ignorant demand that destroys the credibility of those making it, or its purpose is to define progress as something that cannot ever be achieved. Stupidity or sophistry? You decide. A certain type of activist doesn’t want that to change, ever. It is just too useful, a gift that keeps giving. The idea that this industry might want to get out of the ‘merchants of death’ business through a technology transition (the only way it can do this from within) is something to resist rather than welcome and encourage. So any positive development they make, for example, establishing a foundation to support the phase-out of combustibles must be interpreted as a false flag evil influencing operation designed, somehow, to keep people smoking (‘how’ has never been explained). The approach to this foundation has been highly revealing: wild hostility to the possible opportunities and a willingness to see $1 billion wasted rather than used productively, combined with a kind of gangland mob mentality that has become a focus for bonding and competitive virtue signalling within the tobacco control activism community. But what if, in reality, these companies are going to be central players in ending the epidemic of smoking-related disease, as I think they will in their own interests? For the activists, this cannot be tolerated… and any move into much less dangerous products, no matter how convincing, has to be interpreted as a plot to keep people smoking, hook youth or ‘undermine tobacco control’. This has been taken so far as to interpret a treaty obligation in a way that implies that a tobacco company can never change its business model and must always be ostracised. That is codified into WHO practice, through the Guidelines on implementation of Article 5.3 of the FCTC. Imagine that? A quasi-legal instrument that insists that your enemy has permanent pariah status, nothing they can do will ever be of value, and that their interests can never align with reducing harm. This was already nonsense when it was agreed in 2008. By then it was already clear that a tobacco product (snus) and a tobacco company (Swedish Match) were responsible for the success in reducing smoking in Sweden and with it, smoking-related disease (see above). 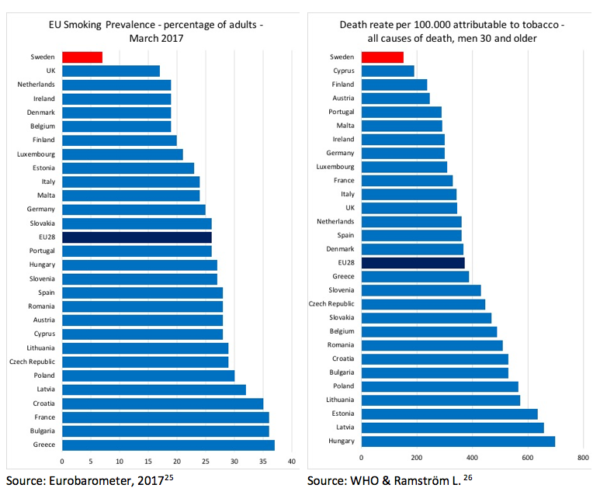 Sweden and maybe now Japan provide a proof of concept for how the tobacco/nicotine market can evolve relatively rapidly to reduce the burden of smoking-related disease. The fatuous counter-argument is that the problem is caused by them in the first place. But other than by wishing away the market in nicotine or by assuming that people only smoke because tobacco companies make them, the public health interests lie in reshaping the tobacco/nicotine market so that the market is primarily served by products that cause little or no harm. As a matter of policy, it is possible and desirable to change the incentive structure facing tobacco companies so that they become agents in accelerating this shift. In this, the interests of tobacco companies and public health policy are not in ‘fundamental and irreconcilable conflict‘ but can be aligned. But tobacco control activists will not even consider this direction, and instead, they do all they can to prevent that industry shifting to better products in the interest of consumers and those at risk. As David Sweanor puts it, what a gigantic failure of imagination. Why has all this happened..? That’s a subject for a future blog. That was an amazing writing. I think you raise a significant point here, its not all about health, mostly its the economics behind of all these activists, and for now, their industry is bigger both in terms of influence and money, so vaping community is certainly up against it here. What an insightful piece about the subject, thorough yet awesome writing. The quote “Life is short and shorter for smokers. Just legalise vaping.” is now my favorite one to advocate vaping. And Bill up there has also made a significant and correct point, its not all about health, mostly its the economics behind of all these activists, and for now, their industry is bigger both in terms of influence and money, so vaping community is certainly up against it here. Fantastic blog, keep up your fight. I’m sure it will be all worth it in the future. There are also many underlying financial/economic reasons why different entities want to ban the sale of tobacco harm reduction products. US healthcare service providers now receive $15 (treating cigarette diseases/disabilities), and governments receive $4 (in taxes and settlement payments). A rapid decline in cigarette smoking disrupts incomes of many different drug manufacturers (not just tobacco treatment drug manufacturers), pulmonologists, cardiologists, thoracic surgeons, oncologists, radiologists, respiratory therapists, oxygen tank manufacturers, cancer treatment centers, hospitals, tobacco treatment service providers, tobacco control researchers, universities, tobacco control organizations, government regulators, government revenuers, etc. It has long been obvious to me that the underlying reason the previously listed entities (whose business models rely upon cigarettes, including sick and dying smokers) have been demonizing and lobbying to ban low risk tobacco alternatives is selfishness and greed; they don’t want to lose their primary, secondary or even tertiary sources of revenue. Understanding and exposing these financial conflicts of interest (that have been cleverly disguised for decades) will make it easier to advance THR. First, congratulations and grateful thanks for this splendid commentary perfectly skewering the deeply flawed arguments by e-cigarette critics. 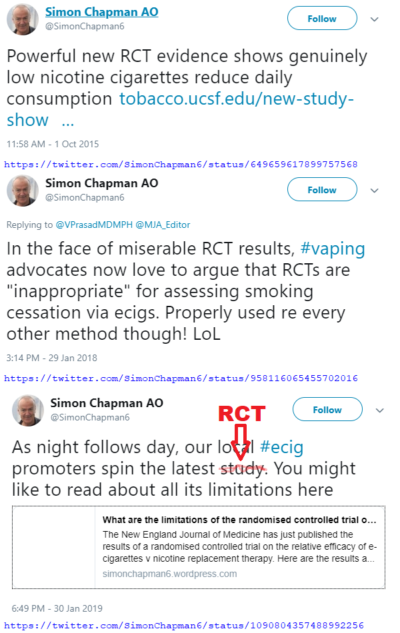 The claim that ‘safer products lead to more harm’ lies at the heart of most debates about harm reduction and the debate about e-cigarettes is quintessentially yet another debate about the latest harm reduction strategy. But I think that the possibility should be taken seriously that reduced adverse consequences of a risk behaviour may result in more frequent or more reckless risk behaviour (or both). This concept, known to psychologists as the ‘risk compensation hypothesis’, involves risk takers trying to maintain their risk level at an equilibrium. When car seat belts were introduced many decades ago some claimed that any benefits would be swallowed by drivers driving faster or more recklessly. That was quickly shown to be nonsense. The same concern was debated when needle syringe programs were introduced in the 1980s to slow the spread of HIV among and from people who inject drugs. The concern was that injecting careers would start earlier, last longer and involve more frequent injecting. All were disproven. But there are some examples where risk compensation has occurred. So rigorous empirical evaluation is always critical when a new harm reduction strategy is introduced. Oodles of common sense in this blog, but that is a quotable quote. Their cups doth overflow with fear and indignation. Re the costs of inaction , in the past few weeks Australian authorities have sized two illegal tobacco crops . The combined weight of just those two crops was around 100 tons , excise value about $100 million AUD. Australia clearly has a big and growing black market for tobacco. It’s already clear that in Australia ever more punitive taxes and prohibitions on smoking without allowing legitimate markets for smokeless alternatives is creating more money for organised crime, corruption all the social costs that goes with that. You eloquently mention the obvious visible distortion of science, but there is a more subtle distortion. You mention the screaming by easily identifiable sources of junk science, but there is a flow of more subtle less noisy murmurs of misinformation that is harder to identify. The more subtle forms of misinformation accept that vaping “is less toxic” than smoking, they no longer scream “beware of the formaldehyde”. Instead, they place layers of unjustifiable “precautionary” uncertainty on something (safety of e-cig aerosol) that is already an experimental fact. The analytic chemistry of vapor aerosol is no longer cutting edge science that requires ultimate technology, but standardized knowledge that can be comfortably passed to industrial processing. To keep alluding and assessing some “probable” risks that are not negligible requires quite a lot of sophistry. The report by the NASEM (National Academies of Science, Engineering and Medicine) of the USA provides a nice example of the hush murmur misinformation. Their evaluation of environmental e-cig aerosol still grants a “moderate” probability that it could be harmful, which is nonsensical. Looking at the section in detail reveals that this assessment is based less on looking at the contents of the reviewed articles and more on number counting of how many studies (among those reviewed) concluded positively or negatively on this issue. Their “moderate” risk assessment strongly depends on the unjustified weight they grant to a reviewed article that makes a big issue about particulate matter without mentioning that “particles” in e-cig aerosol are droplets. This is surprising, since in the section devoted to the risk evaluation of the inhaled aerosol they explicitly mention that these particles are harmless. The notion that these droplets suddenly become moderately risky when exhaled is ludicrous. This contradiction in risk assessments in the NASEM report could be unintended sloppiness, but it could also emerge from the needs of the policies that the FDA (which commissioned the report) wants to promote. Admitting that inhaled vapor is not particularly harmful justifies treating vaping as a smoking cessation tool, while claiming that there is “moderate” harm from environmental vapor justifies extending smoke-free policies to vaping, all of which is in tune with the desire to restrict the recreational social spaces for vaping and, at the same time, keep it only and exclusively as an adult smoking cessation tool. This is a more subtle political usage of science, since the data and the best quality studies (such as that by Igor Burstyn) really reveals that risks from “second hand” vapor are not “moderate” but “negligible” and close to zero.